Sometimes we take an old friend for granted. It’s not that we don’t like them, it just that they are always there, always reliable and you just know you can count on them. My Weber Genesis Propane Grill is like that. With all the posts I have done on my barbecue, smoking and grilling tools, I just never thought of doing a review of my propane grill. Like I said, you take some things for granted. If you look closely at the picture, the grill may not look pristine. Well, it is over a decade old. It has been used a lot but just keeps working. It is easy to use. You just turn on the propane, hit the ignition switch and away you go. It has very even heat across the grill surfaces. It has way less hot and cold spots than cheaper grills. The stainless steel surface is easy to clean. It has a range of very low to very high heat. The side burner kicks out more heat than cheaper models. It is durable. As I said, mine has over a decade of use. It is expensive. You can definitely buy a cheaper grill. There are three burners that run across the grill lengthwise. I prefer to have the zones I control be left to right not front to back. I would like to comment on the service but as I haven’t needed any service, I can’t speak to it. I will talk about the grill versus my pellet smoker. I consider these two different methods of cooking. The pellet smoker is like an oven that you can broil on but it’s strengths are longer lower cooking temperatures. It also adds a nice smoke flavour to the food. The grill is a grill that can cook at lower temperatures by using the indirect method. 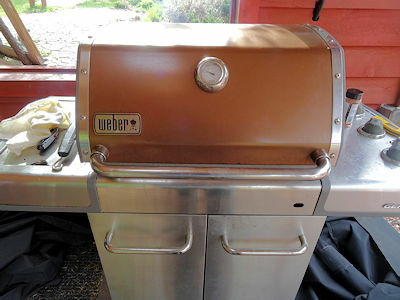 If I was doing burgers or a quick grill, I may use the grill because it is quicker to set up and comes to heat faster. However, I have done great steaks and burgers on the pellet smoker. If I was doing a roast, whole chicken or ribs, I would tend to use the pellet smoker because it gives me more temperature control and the touch of smoke. However, I have done great roasts, chickens and ribs on the grill. You could easily get by with the pellet smoker or grill only but both give such a wider range of options. If you want a propane grill, I can’t recommend the Weber too strongly. It just works and keeps working. If you want a pellet smoker, the Louisiana Grills smoker has been great. She Who Must Be Obeyed suggests I am a fanatic because I have both. I like to think I am a dedicated Old Fat Guy.